Celebrate the spirit of the South Pacific at this tropical oasis of coconut palms, lush vegetation, koi ponds and white-sand beaches. Village longhouses flank the Great Ceremonial House, where torch-lighting, drums and a traditional fire-knife dance welcome the night. On the shores of Seven Seas Lagoon, Disney's Polynesian Resort invites you to savor "Ho'Onanea"—the passing of time in languid tranquility. Views of Garden, Pool, Marina, Monorail or Parking Area. Views of Seven Seas Lagoon . 2 Queen Beds and 1 Day Bed. Views of Magic Kingdom Park and Seven Seas Lagoon. 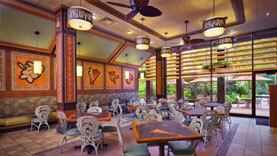 Hang loose with Stitch and friends at breakfast and enjoy games, storytelling and a Hawaiian-style feast at dinner. 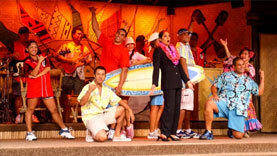 Enjoy an enchanting luau with Polynesian dancing and an all-you-care-to-enjoy, family-style feast. 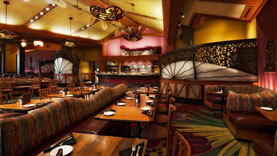 This relaxed café infuses a bit of Asian zest into traditional American meals and features an onstage pastry kitchen. Explore your options with breakfast till 10:30 AM and grill items for lunch or dinner until 11:00 PM. Choose from sandwiches, burgers, salads, stir-fries, flatbreads, sushi and grab 'n' go items. 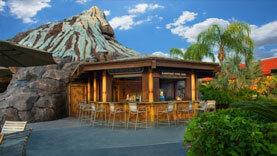 Dole Whip, beer and wine are also available. 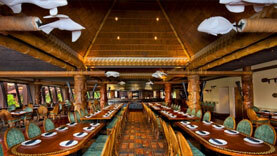 Say aloha to coffee and pastries in the morning and made-to-order sushi and sashimi in the evening. Try a California luau roll, made with fresh jumbo lump crab, or the Hawaiian-style tuna poke. Cocktails, wine, beer and sake are available. 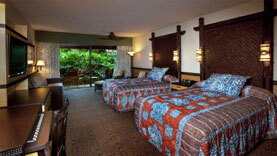 Kick off your shoes and enjoy the white sandy beach as you sip on Tiki drinks and take in views of Magic Kingdom park. 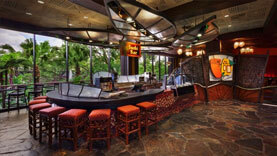 Try the Captain’s Mai Tai or a Pipeline porter infused with Kona coffee. Beer, wine and a full bar are also available. 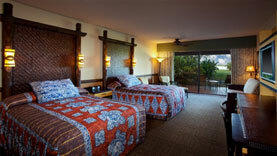 Take the plunge at Nanea Volcano Pool or lounge the day away at the Polynesian East Pool. Cozy up for a favorite Disney film shown outside in the fresh evening air. 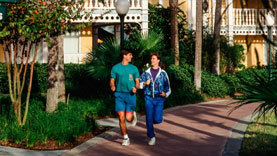 Jog on pathways throughout Walt Disney World Resort. 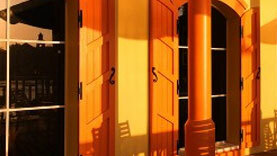 Distances are approximate, and maps are available from Lobby Concierges. 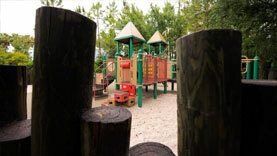 Let your little ones burn off their excess energy at fun playgrounds designed with them in mind. 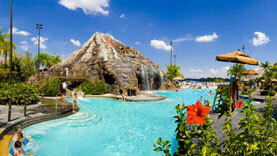 Kids 2 to 12 years of age will love Walt Disney World Resort playgrounds, adjacent to many Resort hotels. Watch them run free in immersive environments featuring soft and textured surfaces, swings, tunnels and slides designed for interaction. Walt Disney World Resort playgrounds can be found at the following locations (please note that adult supervision is required). Play the latest and greatest family-friendly video games at locations throughout Walt Disney World Resort. With arcades at every Disney Resort hotel, choose from a total of 1,500-plus games appropriate for all ages. Go for a personal best or go head to head against a friend as you battle aliens, play sports, race cars, dance to the beat, make music, solve puzzles or try your hand at pinball, air hockey and more. To play games, you must first purchase a Game Card and add game points using cash, a credit card or your Key to the World card at a kiosk inside the arcade. Game Cards are rechargeable and can be used at other Walt Disney World Resort arcades. Arcades are open daily. Closing times vary by location. 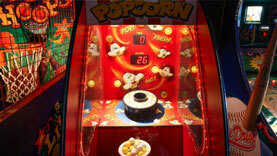 Games are evaluated for content using American Amusement Machine Association (AAMA) standards. Win prizes! Redemption arcades, where you collect e-tickets you can trade in for cool prizes. Most areas throughout Walt Disney World Resort, including theme parks, water parks, Disney Resort hotels and the Downtown Disney area, are accessible by complimentary bus transportation. 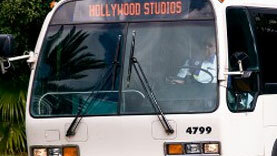 The bus stop at Disney's Art of Animation Resort is located outside Animation Hall. Enjoy complimentary transportation and luggage delivery to and from Orlando International Airport. Advance reservations are required. 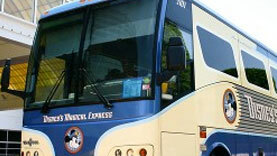 The Disney’s Magical Express bus stop is located in front of Animation Hall. 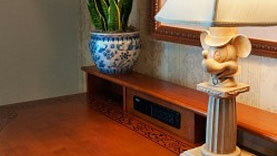 Enjoy complimentary wireless high-speed Internet access (Wi-Fi) in Guest rooms and most public spaces. 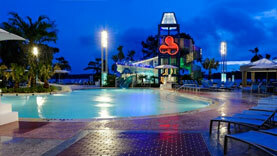 Wi-Fi is also available in restaurants, bus loading zones, pools, arcades, convention spaces and the porte-cochere. Please note that a Wi-Fi enabled device is required to take advantage of complimentary wireless Internet access through the Resort. 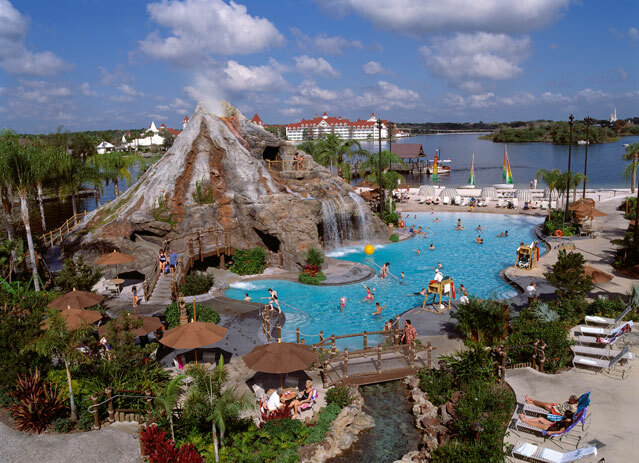 Parking at theme parks and Disney Resort hotels is complimentary for Guests with a valid Key to the World card or Resort Parking Permit. 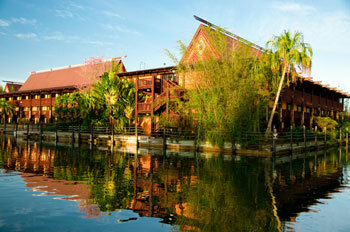 Guests pay one fee per day to receive a parking pass good for all theme park parking lots. 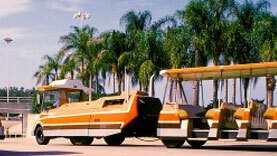 Car/Motorcycle/Taxi/Shuttle/Limo: $14/day, Camper/Trailer/RV: $15/day, Bus/Tractor Trailer: $18/day. Annual and Premium Passholders, in addition to Disney Premier Passport holders, can park at no additional charge. 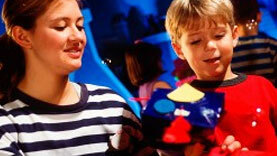 Convenient in-room babysitting and children's activity centers are available for the kids at select Resort hotels. Independent childcare provider Kid's Nite Out offers one-to-one babysitting in the comfort of your Walt Disney World Resort hotel room. Arts and crafts, reading and playing games are among the fun-filled activities for children 6 months to 12 years of age. 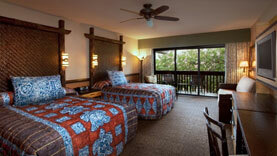 For the comfort of all Guests, smoking is only permitted in appointed places throughout Walt Disney World Resort. Check the theme park Guidemaps for specific locations. A fee up to $500 will be charged to Guests smoking in the following non-smoking areas: Guest rooms, including patio and balcony areas, Restaurants, Ballrooms, Indoor and Outdoor common areas. 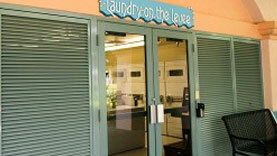 24-hour self-service laundry rooms are available near The Big Blue Pool, Flippin’ Fins Pool and Cozy Cone Pool. For dry cleaning and valet laundry service, please select “Housekeeping” on your Guest Room phone. If you're staying at Disney's Art of Animation Resort, you can arrange to have park souvenirs delivered to Ink & Paint Shop inside the hotel instead of carrying them around with you all day. 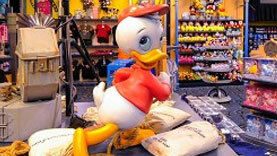 Simply tell the Cast Member during the time of purchase and arrangements will be made quickly and easily. © 1999 - 2017 TotallyTrips.com All rights reserved In association with Be'met, Inc.